Hands down, the biggest, most powerful timer for teachers available. Mega means big. The MegaTimer measures in at a super-sized 9.5 by 6.5 inches. The jumbo LCD display with a brilliant blue backlight is so big and bright, you can read the display from the back seat of your classroom. Mega also means powerful. Powerful it is with all the standard timer features you would expect, plus many, many more. The MegaTimer's design is so unique and versatile, it is patent pending. Push the Student Selector button to randomly pick any student to share. Push the Team Selector button to randomly pick any team in the class to present. Use the Count Down timer to display how much time remains for students to complete their projects. Use the Stop Watch timer to challenge the class on how long it takes to clean up. Need dice, a spinner, or random numbers for math problems? The Random mode will generate random numbers for you. Set an Alarm to remind you and the class it's break time. Students seem a little sluggish? Press the Temperature button to check if the temperature is optimal for learning. And when you're not using the timer, display the Time and Date. Carry it around, hang it on the wall, or use the stand to place it on your desk. This is the timer you don't want to be without. 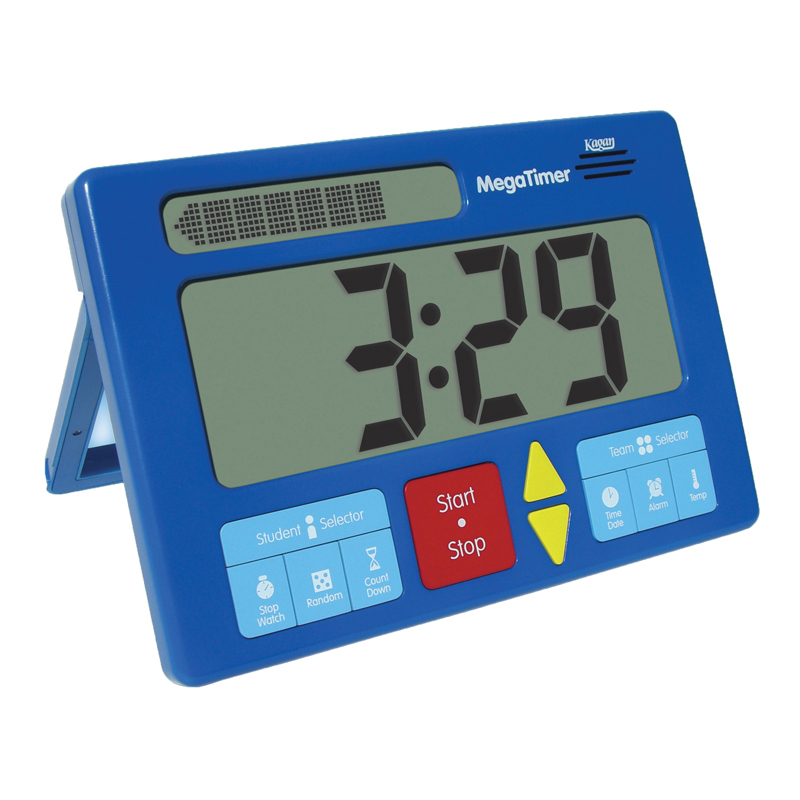 Nowhere else will you find so many teaching tools packed into one digital timer. It's big. It's powerful. It's the MegaTimer! Requires 6 AA batteries, (not included).